Byrnes & Kiefer has been around since 1902. They have had steady growth and an expansion of their product line to include a variety of baking supplies and baked goods. Currently, Byrnes & Kiefer has a selection of 300 artisan bakery products. All of their facilities are SQF Level 2 certified through their SQF Food Safety Management System. They are committed to providing customers with safe food products and are Kosher certified. Godshall’s Quality Meats began as a butcher shop in 1945, but has quickly grown into a company with two major facilities in Pennsylvania. They are dedicated to supplying premium meat specialty items to their customers and takes pride in their state-of-the-art facilities. Godshall’s takes the green initiative wherever they can, including facilities powered by solar modules, and a zero landfill program. J&J Snack Foods was established in 1971 with only 8 employees. Today, they are a leader and innovator in the snack food industry. They provide unique and niche snack foods and beverages to their retailers. This includes the invention of the Funnel Cake Fries, which were created for Rutter’s. Some brands of their many products include ICEE, The Funnel Cake Factory, Minute Maid, Dogsters, Slush Puppies, and Oreo Churros. In 2005, Lifestyle Foods began with creating a better salad with greater visual appeal and longer lasting than an ordinary salad. Today, Lifestyle Foods has expanded beyond salads to offer a full solution for healthy and convenient grab-and-go eating, including entrees, salads, sandwiches, snacks, and sides. Extended shelf life, quality ingredients and the lifestyle look (thoughtful packaging) is what sets Lifestyle Foods apart. Mom’s Wholesale Foods is a family-owned and operated business dating back to 1979. Their products are distributed to more than three states. Mom’s Wholesale Foods is USDA inspected and one of only a few Pepperoni & Cheese Rolls in the country. They believe in and support local charities by donating thousands of dollars in food to local causes and donated pepperoni rolls to Texas in 2017 during Hurricane Relief Efforts. R.W. Sauders began in the 1930s during the Depression Era. Today, R.W. Sauders is still family-owned and operated. Their hens produce about 1.5 billion eggs each year. They are committed to raising happy, healthy hens in cage-free, organic farms. This increases the quality of their eggs. R.W. Sauders works with around 120 farmers, many of which are family-owned and operated. Quality control is extremely important to R.W. Sauders. Sea Watch International was founded in 1978 and has been a major clam supplier. They are recognized as the largest harvester and processer of clam products in the world. Sea Watch International has multiple Green Initiatives, including Carbon Disclosure Project, Water Recycling, and Alternative Energy Sources. All Sea Watch manufacturing facilities undergo many audits performed by various government agencies to withstand their standards. Snyder’s Lance merged in 2010, however Snyder’s of Hanover began in 1909 and Lance, Inc. was founded in 1913. Snyder’s Lance has a passion for quality and will never compromise on the quality of their products. They also have a passion for the communities and believe in supporting the communities that support them. Some of their brands include Kettle Brand, Cape Cod, Snack Factory, Pop-Secret, and Emerald. TastyKake started in 1914 as the Tasty Baking Company, which baked and delivered individually wrapped snacks cakes daily. Today, TastyKake has merged with Flower Foods and brings snack cakes to retail stores all around the country. TastyKake is a green bakery. One of their biggest green initiatives is their building earning LEED Silver certification, which stands for Leadership in Energy and Environmental Design. York Ice Company is one of the oldest, family owned, continuous operating ice companies in the United States. It started out in 1872 as a conjoined ice delivery and ice cream making business. They are currently run by their fifth and sixth generation. Today, their ice is being delivered by refrigerated trucks to keep up with the demand. York Ice has a long standing tradition of serving the community’s needs and adapting to change. Bimbo’s Bakeries story began in 1994; however, some of their brands and products go back to the late 1800s or early 1900s. Today, Bimbo Bakeries operates more than 60 bakeries throughout the United States. They currently have over 10 different brands. Some of their iconic brands are Thomas, Sara Lee, Entenmann’s, Maier’s, and Stroehmann. Their purpose is to build a sustainable, highly productive, and deeply humane company. Since 1935, Deli Brands of America has been using the same old-world family recipes to produce their high quality corned beef, roast beef, pastrami, and many other products. Deli Brands of America is a family-owned company in their fourth generation. Their goal is to provide superior meat products that are backed by committed support and services that contribute to the success of their customers. Henry’s Seafood has been supplying their customers with fresh seafood for over 30 years. They have partnered with Rutter’s to customize their own crab cakes. They pride themselves on delivering the taste of the Eastern Shore. Henry’s Seafood uses Maryland crabmeat from one of the oldest crab picking house in Cambridge, Maryland, the JM Clayton Crabmeat Company. They offer a variety of products that emphasize on quality and value. Kraft Heinz became a company after a merger of their two companies in 2015. They are the fifth highest food and beverage company in the world. They are committed to investing in world-class brands and long-term value creation. They are also committed to reducing their environmental footprint and protecting the planet’s natural resources for future generations. A few of their brands include, Oscar Mayer, Velveeta, and Jell-O. Martin’s has grown since they started in Harry and Fairy Martin’s kitchen in 1941. Today, Martin’s distributes snack foods from New York to North Carolina. They are committed to being a sustainable company by using plant waste and oil in multiple recycling processes. Additionally, as a family owned company, they take pride in giving back and serving others through product, service, and monetary contributions. Nabisco dates its founding to 1898. They are currently a subsidiary of Mondelez International. They currently operate the largest bakery in the world with their plant in Chicago. This location also employs more than 1,200 employees and produces an estimated 320 million pounds of snack food each year. Some of Nabisco’s products include Oreo, Nutter Butter, Swedish Fish, Belvita, Ritz, Trident, Honey Maid, and Wheat Thins. Red Truck began in 2012 when owner Richard Criswell decided to create a healthier, non GMO, flavorful beef jerky for his sons. After a few years, McCormick reached out to Red Truck to create a new Red Truck Old Bay flavored jerky. Since then, Red Truck has created new beef jerky flavors with McCormick Grill Mates, including Montreal and Brown Sugar. Red Truck employs approximately 10 employees in their main distribution facility. In December 2000, Shaffer Venison Farm opened their modern processing plant. This helps them control the quality of their venison from the farm to the customer. Shaffer Venison Farm is a family owned and operated venison and elk processing plant. They are committed to high quality venison and elk products free of growth hormones or other chemicals. Shaffer Venison Farm’s animals are given a diet of natural foods and minerals. Spring Glen Fresh Foods has been serving the Pennsylvania area since 1942. They started out making baked goods for many neighbors and the community, but have since grown into a wholesale company providing quality, hand-prepared food products. Spring Glen Fresh Foods is a part of the Hanover Foods family. The recipes they use today are the same as they were over 75 years ago with quality, fine ingredients. Tulkoff started as a family produce stand in the 1930’s. One of their biggest sellers was their homemade horseradish. This lead to Tulkoff’s business growing into one of the nation’s largest food manufacturers of horseradish products. Today, Tulkoff is in the third generation of the family ownership. They recognize the importance of food safety and quality standards and participate in the Global Food Safety Initiative. Boyer Candy Company was founded in 1936 by brothers Bill and Bob Boyer. They originally produced candy in their mother’s kitchen as a way to increase their income during the Depression Years. They pride themselves on being kosher, gluten free, and American made. Today, Boyer Candy Company produces multiple types of candies including Mallo Cups, Dark Mallo Cups, Peanut Butter Cups, Smoothie Cups, and Triple Twist Pretzels. Garrett Valley is a family owned and operated company since 2001 and is a third generation, proudly independent company. They are dedicated to crafting only the finest all-natural and organic meats. Garrett Valley’s products are all free of antibiotics, nitrates, nitrites, preservatives, and artificial ingredients. They only use humanely raised animals and only works with farms that raise their animals in a stress-free and free-to-roam setting. Hershey’s recipe hasn’t changed since its creation by Milton Hershey in 1894. Hershey’s created a line called Simple, which is Hershey’s Milk Chocolate with only simple ingredients and never any artificial flavors, preservatives, or sweeteners. They completed a major expansion at their facility in Hershey in 2012, which will allow them to make their chocolate in Hershey, PA for the next 100 years. Kunzler & Company was founded in 1901 by Christian Kunzler, a German butcher. They are currently on their fourth generation of the family operated business. Kunzler & Company worked with Rutter’s to create the Bacon-Wrapped Cheddar Dog, which was exclusive to Rutter’s for a few months. Kunzler & Company is incorporating efforts to use less energy by working with the Pennsylvania Power & Light Utilities and Strategic Energy Group. Mike’s Nut Shop has been a family-owned business for over 115 years. They are owned by Paul and Paula Stoeckle. The original Mike’s Nut Shop was located on West College Avenue in York, but was destroyed in an explosion in March 2007. Their focus is on healthy and fresh snacks, which is why their recent, newly designed logo to showcase nuts and leaves. Mike’s Nut Shop employs around 10 people in York County. In 1973, Pellman’s began in the family kitchen of Bill and Ruth Pellman. Their goal is to make quality products for their customers. Pellman’s spends many hours on perfecting new products. All of their products are made from scratch, so there are no mixes or shortcuts. They only buy the best ingredients and maintain consistent quality. Pellman’s makes a variety of high quality products including cheesecakes, tortes, pies, and cakes. The pork items offered by Rutter’s are largely sourced and produced from pork raised by the nearly 4,000 pig farmers in the Commonwealth of Pennsylvania. Which is the 12th largest pork producing state in the US and raising approximately 1.3 million head of pigs. 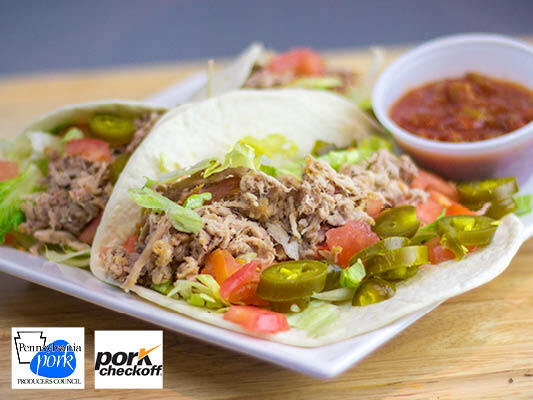 The National Pork Board in conjunction with PA Pork Producers Council want to thankRutter’s and its customers for supporting your local pig farmers. Rutter’s Beverage Company’s story began in 1921 when milk was sold for 8 cents per quart and on a horse-drawn wagon. Now, Rutter’s Beverage Company distributes products throughout the Mid-Atlantic region. Their products have grown from being just milk to teas and juices as well. The Rutter’s Beverage Company’s milk comes from various local farms in the Central Pennsylvania and Northern Maryland regions. Smittie’s Soft Pretzels have been a family run business since 1934 when Lester Smith and his family would sell his pretzels door-to-door. Today, Smittie’s is owned by the third and fourth generations of the Smith family. They give their customers real taste, made with real ingredients, and real quality. Smittie’s Soft Pretzels offers soft pretzels, pretzel rolls, pretzel bites, and various holiday specials, like flowers for Mother’s Day. T&L Distributing Co.’s story began in 1985 as a meat snack distributor. Today, they are a company specializing in non-chocolate candy, nostalgic candy, nuts, and meat snacks from all over the country. T&L Distributing Co. has their own top quality beef top round jerky company, called Black Beard Beef Jerky, and a candy company specializing in unique candy, called Kelly’s Candy Kitchen. They regularly donate to the Northampton Area Food Bank. Winter Gardens Quality Foods has been a family owned business for over 40 years. They have dedication to quality, integrity, and consistency for all their products. Winter Gardens produces more than 250 different products using local produce and regional ingredients. They are FDA, USDA, and SQF certified facilities. Additionally, Winter Gardens maintains a complete HACCP program and conducts extensive pathogen monitoring. Not all brands and products available in every location. See store for details.